Director/Screenplay – Steven C. Miller, Producers – Geoffrey James Clark, William Clevinger & Jeremy McCormick, Photography – Jeff Dolen, Music – Jamey Scott, Makeup Effects – Rick Gonzalez, Production Design – Jerry Eller. Production Company – Momentum Pictures/Through the Heart Productions. At high school in Grover City, Florida, a student has to be taken away by medics wildly frothing and having bitten the teacher. One of the other students, Chris Swartz, drives to the city to see a band with his two best friends Scott and Tim, only to find the city overrun with zombie hordes seeking to devour the flesh of the living. Meanwhile, Chris’s girlfriend Jackie has gone to a house party with several other students, only for it to be invaded by zombies. Steven C. Miller has emerged as a regular genre director in the last few years. Automaton Transfusion was his directorial debut and he subsequently went on to make the Syfy Channel film Scream of the Banshee (2011), the home invasion thriller The Aggression Scale (2012), the killer Santa film Silent Night (2012), the children’s horror film Under the Bed (2012) and the thrillers Extraction (2015), Marauders (2016), Submerged (2016), Arsenal (2017) and First Kill (2017). 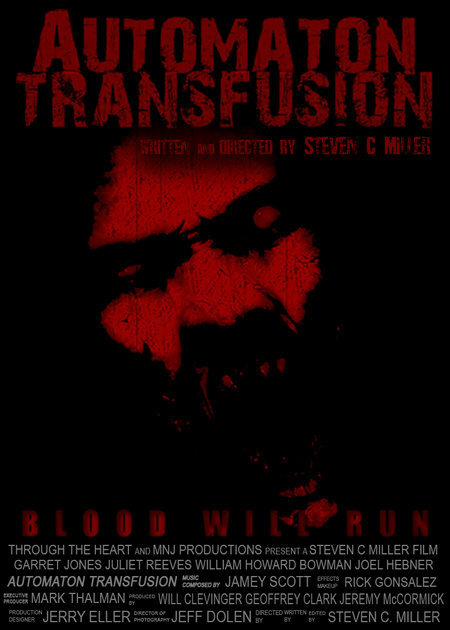 Even though it has a title that makes you think of a 1990s direct-to-video killer android/cyborg film, Automaton Transfusion is a zombie film. (Well a zombie film with a pretentious-sounding title). Miller made it at the time that the zombie revival of the mid-2000s was just gaining its stride following the successes of films such as Resident Evil (2002), 28 Days Later (2002), Dawn of the Dead (2004) and Shaun of the Dead (2004). As an entry amid the plethora of mid-late-2000s low-budget zombie films, Automaton Transfusion is fairly typical. It is fired up by an enthusiasm for the works of George Romero and made with more all-out energy and fannish enthusiasm than it necessarily is skill. The one virtue that it (and many of the other copies) offer is copious splatter and gore – Automaton Transfusion‘s one dubious novelty effect is a scene where a zombie tears the foetus out of the stomach of a pregnant woman and then devours it. The plots of these zombie copies all follow fairly similar stories of outbreak and siege (a reason that the zombie films over the next few years turned to parody and gonzo mash-ups to try and add something new). Indeed, this relentless milking of the vein by enthusiastic but ultimately unimaginative amateurs is what caused the creative well of the genre to dry up. In all of this, Steven C. Miller demonstrates little more than at least a technical command of the basics but nothing more than that. His subsequent films gained better budgets but he has still to become a director that you look to for style or imaginative visuals. The film also ends not on a resolution but a cliffhanger where the heroes are abandoned outside the morgue facing a horde of oncoming zombies with a ‘to be continued’ – the promise of a sequel that Steven C. Miller has yet to fulfil.